This massive fortress in the foothills of the Pyrenees was built by King Louis the Pious in 789 as a central strong point for securing territories reconquered from the Moors. The counts of Cardona began work on the present structure in 1020. A nephew of the Emperor Charlemagne, Count Ramón Folch, took over the governorship of Cardona, and his descendants were elevated to the rank of duke. A legend relates that the beautiful daughter of Ramón Folch was imprisoned in the tower by her brothers after she fell in love with a Moor and converted to Islam. She died within the year. Cardona was always highly desired for its salt beds. A constitution dating from 986 allowed the inhabitants personal use of the salt one day a week if they, in turn, donated a day’s work to the castle’s upkeep and pledged fidelity to its protection. Standing on a conical hill 1500 feet above the walled village, the castle was never conquered through a long history of wars. French and Spanish troops failed in their attempt to overtake it during the War of the Spanish Succession in 1711. A hundred years later the castle remained standing after a long siege during the Peninsular War, and the Carlists failed to take it during the Spanish Civil War. If the Cataluña region of Spain is your destination, you can make an interesting excursion from Barcelona to Montserrat, overnighting at Cardona and then continuing on to the tiny principality of Andorra. 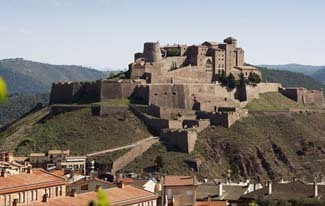 Cardona is 97 km northwest of Barcelona on C-1410. A car is the best means to get there. In this meticulously cared for parador, you’ll find red tile floors shined to a high gloss, wood beams covering arched ceilings, heraldic tapestries and wrought-iron torches decorating the walls, and many Catalan antiques filling the rooms. The restaurant is situated in an ancient stone vaulted room. The menu offers typical Catalan dishes such as salmon in red pepper sauce and wild boar with chocolate. Wild mushrooms and stews are a specialty as well. Cardona is a Spanish National Monument, with its Gothic court and chapel now preserved as a museum.